Christ Church Cathedral (The Cathedral of the Holy Trinity, commonly known as Christ Church, Cathedral of the United Dioceses of Dublin and Glendalough and Metropolitical Cathedral of the United Provinces of Dublin and Cashel) in Dublin is the elder of the city’s two mediæval cathedrals, the other being St. Patrick’s. 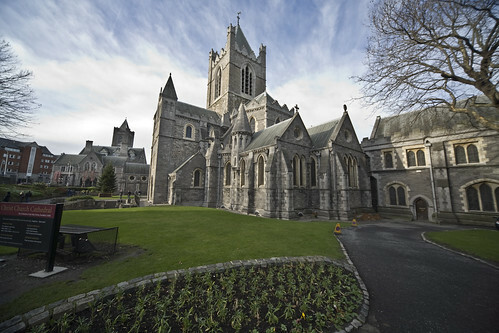 It has been the seat of the archbishop of Dublin (initially solely Roman Catholic, then Church of Ireland) since mediæval times, though for many centuries, it shared this status with St. Patrick’s. It is located at the end of Dame Street and the beginning of Patrick Street, overlooking the River Liffey.